Mobile search is officially a way of life for consumers – 80% of people don't leave home without their mobile device and 61% of smartphone owners perform searches from their device every single day. In fact, consumers are now spending over 15 hours per week researching from their smartphones. AdWords mobile PPC ads are your ticket to appearing in front of people who are already on the go, looking for information, and often showing great intent to make a purchase. Enhanced Campaigns were a much-needed addition to Google AdWords, but some marketers still feel intimidated by mobile PPC. This guide will walk you through the steps you can take today and in the coming weeks to set up an effective mobile PPC program and get in front of more target prospects, when and where they're looking for you. SMART goals are: Specific, Measurable, Achievable, Realistic and Timely. PPC is largely results driven, making clear goal setting and documentation mission critical. Your mobile marketing and PPC strategy must align with your greater business goals. A few examples of PPC goals are increasing clicks to your website, improving click conversions, enhancing click-through rates or decreasing cart abandonment. Your goals might also focus on specific customer engagement metrics like generating more calls or map lookups. Whatever your metrics, your goals must be SMART to ensure success. Precise targeting helps you home in on high-intent searchers in your target market. A solid understanding of context – the time, location and device of the search – also helps you better pinpoint which search queries are a good match for your ads. Who are your prospects and customers (think age, gender, location, level of education, income bracket, etc.)? What are they looking for or trying to accomplish? What are their habits, interests and purchasing habits? When are they usually online and searching for information about your product, service or business? Where are they, both physically and online? Where do they live and shop in the real world and where can you find them online (social networks, search engines, etc.)? This insight helps you define your market and also drives your ad creative. Again, context is incredibly important in keyword discovery for mobile PPC, as searchers might use different phrases and keywords when looking for information from their mobile device. More than half of consumers searching from a mobile device intend to make a purchase within the hour, so choosing the right keywords to get in front of that demand is critical. Given the massive volume of keyword combinations available, discovery can quickly become overwhelming for marketers. Use our free Keyword Suggestion Tool to find the unique keywords and phrases that will bring you the greatest success. It analyzes your site data and traffic to uncover the most relevant keywords searchers are using to find you. Make sure you use negative keywords, as well. This is how you tell Google which keywords and phrases you don't want to appear for, helping you reduce wasted spend on clicks that aren't likely to convert. Research shows that 90% of people move between devices to accomplish their goal, with mobile search having great impact on the purchasing decisions. Ninety-three percent of searchers go on to purchase after a mobile search. Tailoring your ads and landing pages to match this level of intent is key to your mobile PPC success. Repurposing desktop ad and landing page creative isn't enough; AdWords mobile PPC ads must make best use of your keywords and speak directly to mobile searchers. Learn more about optimizing mobile ads here, then use our free AdWords Landing Page Grader to make sure you’re creating effective landing pages that adhere to mobile PPC best practices. Optimize for a mobile experience from start to finish. Research shows that 57% of consumers will not recommend a brand with a bad mobile site and 40% will move on to a competitor after a bad mobile experience. Maximize your mobile PPC ROI by delivering the mobile experience they expect. Enable Ad Extensions across your campaigns. Ad extensions are simple to set up, free to display and can have a huge impact on your paid search performance. Use action-oriented keywords to help users make a decision quickly. Broad match keywords perform well in mobile. Incentivize mobile searchers with offers and calls to action that speak specifically to mobile users. 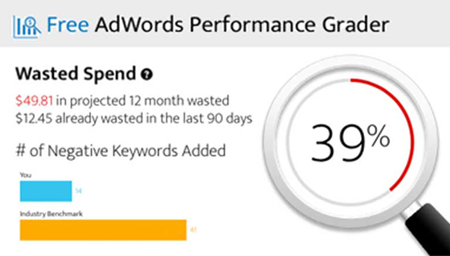 Use AdWords features like dayparting to define when you want your campaign to be active. Optimize your bids for time of day and day of week activity by bidding differentially. For example, people are more likely to be looking for food and drink on a mobile phone right after work. Analyze performance, continue testing and constantly optimize. Define your key metrics and understand how they help you achieve your PPC goals. Smartphone and tablets now account for 32% of paid search clicks and 25% of all PPC ad spend. Mobile is here to stay and it's time to get in the game! AdWords for Mobile can be time- and labor-intensive, so get smart about your approach and automate wherever possible. Automation can not only boost productivity, but quality as well, as it can ensure consistency across ad groups and campaigns.